Israel has displaced almost 66 per cent, nearly 957,000, of the Palestinian people who lived in historic Palestine during the 1948 Nakba, a new report has revealed. 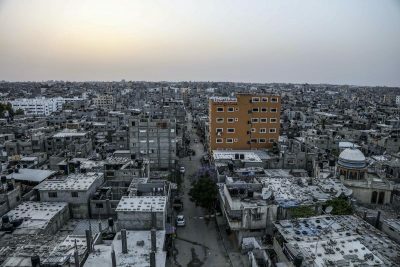 Published on World Refugee Day, the study by the Palestinian Central Bureau of Statistics (PCBS) stated that nearly 5.9 million people are registered as refugees with UNRWA, the UN relief agency tasked with dealing with Palestine refugee affairs, 17 per cent live in the West Bank and 24.5 per cent in the Gaza Strip. As many as 39.1 per cent of Palestinian refugees live in Jordan, 8.8 per cent in Lebanon and 10.6 per cent live in Syria. In an interview with Quds Press, Ahmad Hanoun, director of the Refugee Department in the Palestine Liberation Organisation, said that resolving the refugee issue by ensuring that they return to their abandoned homes in 1948 is “the key to stability in the entire region and the basis of any future political solution to end the conflict”. Hanoun said the world marks World Refugee Day as the Palestinian refugees at home and in the diaspora live under difficult conditions which are exacerbated by the intensification of regional crises in the Arab region and the Israeli restrictions on the West Bank and the Gaza Strip.